Now that you have learned to make rosaries, you may be wondering what to do with all of them. Below we offer some suggestions. But by all means, you are not limited to these. leave a basket of rosaries in the vestibule of the Church. Or, find a Legion of Mary in your area. often give rosaries away. Local Hospitals and Nursing homes will usually welcome your hand-made rosaries. by the owners of PrayTheRosary Apostolate. who receive our sacramentals to make a donation to the poor, such as through St. Anthony's Bread. 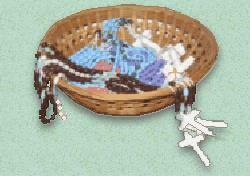 We sell custom-made Rosary Makers Kits and use the profit to buy supplies to partially support our mission work. We also support Priests For Life, Several Sources Shelters and American Life League. Use your back arrow to return to Rosary Makers Guide. If you are serious about making and donating your Rosaries, we suggest you join an organization called Our Lady's Rosary Makers. You will receive a quarterly Newsletter where names and addresses of missions needing Rosaries are listed. 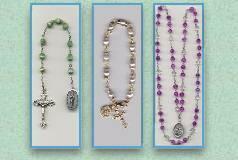 Please click on the icon above to be directed to our NEW "Rosaries for the Troops" page. If you know of a person or organization handling rosaries for the Military, please contact us and we will be happy to post their information. Find out the name of their local Bishop; verify diocese/archdioceses, and priests names for overseas Missions and Chapels. A quick Google search will help you verify this information. Would you like to give a Rosary Mysteries Pamphlet away with each Rosary you make?